United States Encyclopedia: The United States of America (USA), commonly referred to as the United States (U.S.) or America, is a federal republic consisting of 50 states and a federal district. 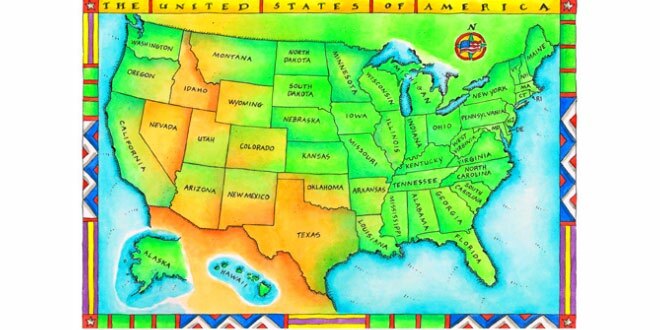 The 48 contiguous states and Washington, D.C., are in central North America between Canada and Mexico. The country also has five populated and nine unpopulated territories in the Pacific and the Caribbean. At 3.80 million square miles (9.85 million km2) and with over 320 million people, the United States is the world’s fourth-largest country by total area and third-largest by population. It is one of the world’s most ethnically diverse and multicultural nations, the product of large-scale immigration from many countries. The geography and climate of the United States are also extremely diverse, and the country is home to a wide variety of wildlife.